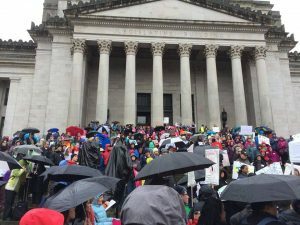 On Monday, February 20, 2017, over 1,000 participants from across Washington state gathered on the Capitol steps in Olympia with the unified ask to the legislature to fully fund education and critical state services. Participants linked arms connecting the temple of justice to the Capitol building, symbolizing our vision of justice in the legislature. We met with legislators, and passed out the EEC Equity Rally Proclamation throughout the day. Equity advocates hold signs on the Capitol steps. Rep. Sharon Tomiko Santos speaks at EEC’s Equity Rally 2017. 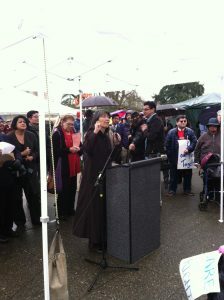 Rain did not stop rally participants from calling for equity. 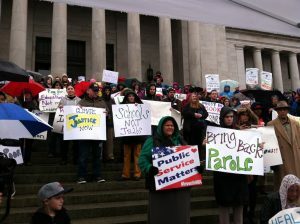 Statewide Poverty Action Network, Schools Out Washington, and AFSCME Council 28 – Washington Federation of State Employees. We deserve a fully funded education system AND the full funding of other critical state services. 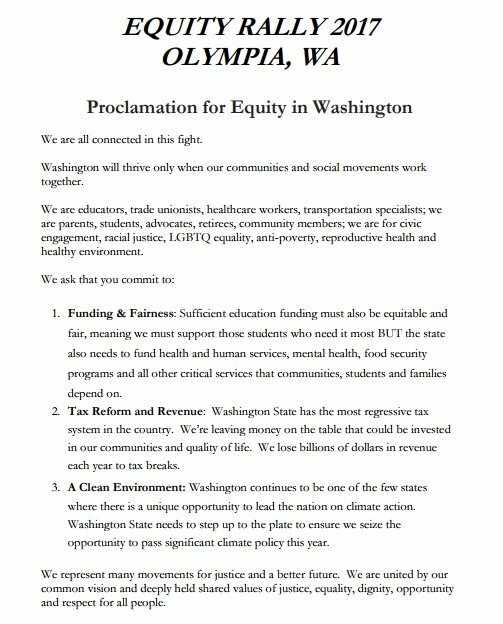 Washington’s budget is a reflection of our most fundamental values and it is time to stand together with one message. Affordable housing, health care, reliable transportation, clean air and water, reliable food sources and a robust economy create an environment in which students are ready and able to learn and reach their highest potential. We must not fund our education system by defunding other services. On February 20 we will all come together to form a human chain linking the Capitol Building to the Temple of Justice – symbolizing our vision of justice in the legislature. We will rally on the Capitol steps, hold a press conference and meet with elected officials to work together towards a more equitable system.